Cooking time again, as our subject for today is evaporated milk. It was on this day in 1851 that Gail Borden came up with the idea to condense milk through evaporation, after seeing fruit juice being condensed using vacuum pans. He worked tirelessly on the concept, and eventually received a patent for his milk condensing process in 1856. Created by evaporating the bulk (about 60%) of the water from fresh milk, evaporated milk differs from condensed milk in that the latter has sugar added to help inhibit bacterial growth. Since evaporated milk does not contain added sugar, it has to be homogenised and sterilised to ensure a long shelf-life. Evaporated milk – still a trusty old stalwart in many a pantry. 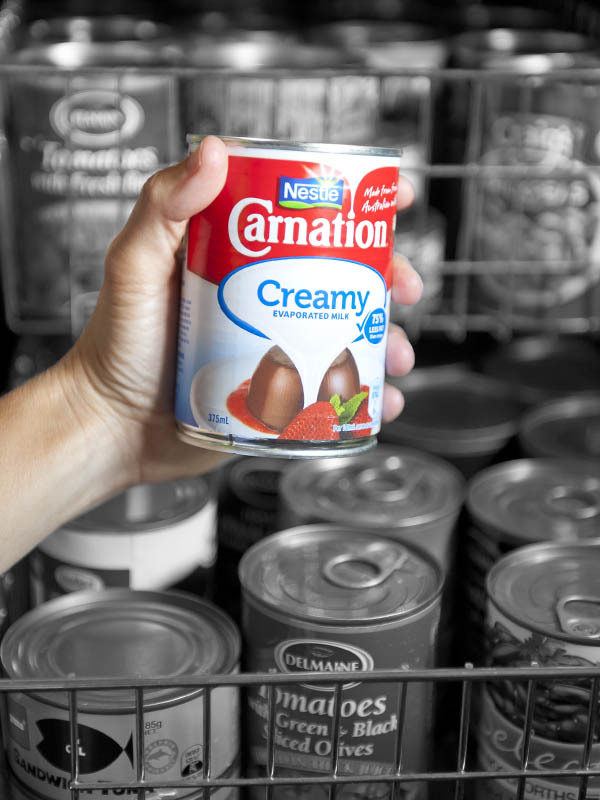 Initially evaporated milk and condensed milk gained popularity at a time when storage and transport of fresh milk was problematic – it could be kept fresh without refrigeration much longer than fresh milk. When water was added back into the evaporated milk it was basically the same as fresh milk, with all the calcium and other nutrients intact, and without the sweetened taste of condensed milk. Interestingly, it was originally thought that it was the condensing of the milk that stabilised it, and only later did it become clear that it was in fact the heating process (to evaporate the water) that killed the bacteria that caused fresh milk to spoil. Today, with pasteurisation allowing much longer shelf life for milk (even without refrigeration, in the case of long-life milk) the usefulness of evaporated milk as fresh milk replacement has all but disappeared. It is still used, but mainly in cooking, and sometimes as a less rich replacement for cream in deserts. Acknowledging this shift, brands such as Nestle are rebranding the product as “cooking milk” in some markets. While it may not be a critical milk substitute anymore, evaporated milk remains so useful in the kitchen that you really should always have a can tucked away in the back of the pantry – just in case you need some to spruce up a creamy dessert, soup, sauce, or even a nice casserole or stew.